Recognising the importance of two-way communication between neurons and glia, this journal fills a growing need to bridge what are traditionally regarded as separate scientific disciplines. 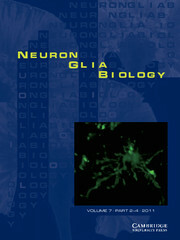 It publishes original research on cell-cell interactions in the nervous system, using molecular, biochemical, electrophysiological, and imaging methods to investigate interactions among neurons and among glia, and between neurons and other non-neuronal cells. Special feature issues and reviews of emerging research areas are also presented.